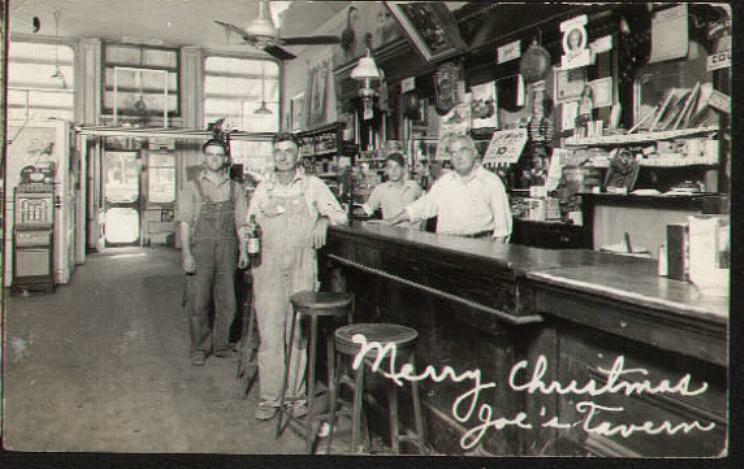 The above holiday greeting was postmarked in 1939 from the Joseph P. Noe Tavern located in the present John and Phyllis Dietel residence on the Metamora Square at 111 E. Partridge Street, Metamora, IL. The building is known by its ladies’ entrance on the east outside wall. In early years no respectable lady would want to be seen walking through the front entrance. Joseph P. Noe died on November 15, 1949. His obituary from the Metamora Herald dated November 18, 1949 tells us that Joe was born and raised in Worth Township. He married Frieda Wyss in 1910 and engaged in farming until 1917 when the couple moved to Metamora. He and his brother, William Noe bought the Otto Weppler Tavern. When the latter entered World War 1, Joe continued to operate the place, and after the war purchased his brother’s interest, prohibition then being in effect. Joe continued to manage the business until his health failed leaving the tavern business to his wife. After one year, the business was sold to William Nauman Sr.
Over the years firemen have been called to the tavern. In August of 1942 a corn popper operated by an oil burner was by mistake filled with gasoline. The fire was extinguished with little other damage than the corn popper. Mr. Noe’s hand and face was scorched in putting out the fire. Again on January 14, 1944 an early morning fire was brought under control by a short but intense battle by the Metamora, Eureka and Roanoke fire departments. Estimate of loss was put at not less than $5000 on building and contents. The fire spread to the building next door owned by Otto F. Giehl and occupied by Lee Tracy who operated a second hand store on the ground flour. Also lost were a collection of relics and specimens gathered through the years. Mrs. Lyle Hockenbury lived in the upstairs apartment. The latest fire took place in December of 1978 when the Partridge Street Primitives antique shop and home of John and Phyllis Dietel was destroyed. This $35,000 fire was thought to be caused by an electrical clothes dryer. The Dietels have renovated this historic building into a charming and cozy home. The property was also owned by Adlai E. Stevenson 1 from 1865 to 1887 while he was practicing law at the Metamora Court House from 1858 to 1868. Stevenson later became vice-president of the United States serving terms under Grover Cleveland from 1893 to 1897. History written by Shirley A. Adams. Photos submitted by Shirley A. Adams and Ken Willman.